Pattern giveaway winner update: Jodit and Nancy's Couture. The dress features pretty gathers at the chest and a clean a-line design. PDF format, available in sizes 9 months to 6 years. What I liked: There is a photograph to correspond with nearly every step in the directions, and this dress is a good one for beginner sewers. There are only two pattern pieces to keep track of (which means very little room for error in my book). No zippers and no buttons required! About the maker: The designer at Little Lizard King is the daughter of a seamstress, so she knows her way around a machine. She is now a momma herself and is inspired by her daughter to keep coming up with new designs. 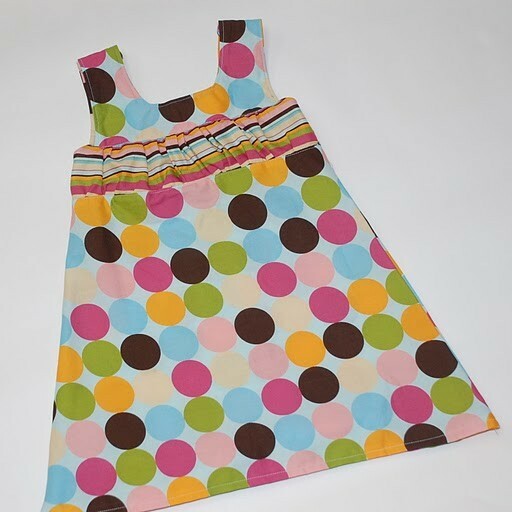 Some of the newest additions to her shop include doll clothing to match her big girl designs. I am totally in love with this! And she's giving away two patterns from her shop to two readers. Just visit Little Lizard King's Etsy Shop and come back here to leave a comment saying which pattern you'd like to win. Two winners will be drawn via Random.org on February 21st to receive their pattern of choice. I love the double ruffle knot top! Thanks!! I think the 2 tiered skirt is so fun! why oh why do you make it so so so difficult...;-)) they are all cute..and i cant decide between the brooke dress and the love me knot dress. adorable on any little munchkin. I like the Elizabeth Claire peasant dress! Oooo... I'm loving the brooke dress and the georgia dress - loving your version too! I am liking the garden party dress but I also like the knot dress too!! Very cute stuff!! The Love Me Knot dress is super cute! Griffins Garden Party! I can't wait to start making clothes for my little girl. Oh my, another great etsy shop! I love the ruffled rumba skirt, and the prep school pleated skirt, and the two tiered mini skirt, they would all be great for my 3 year old! Thanks so much for continuing to feature etsy stores with pdf patterns, I purchased my first ones after you features So Tei Tei, which I loved by the way! I can't wait to check these out! I actually like the one you made...looks simple enough, but so cute. It has so many possibilities! I am all about making clothes right now for my girls-they would love this one! The Little Lauren Dress, and the Georgia Dress are great. I love the blue and yellow you paired together for your version of the Georgia Dress! I love the Brooke dress. Really cute! I love the Love Me Knot dress! All of the patterns are great! It's hard to choose just one. I love the Elizabeth Claire Pheasant dress, the Brooke dress, and the Apron Knot dress. What cute patterns! I love the Garden Dress and the Double Knot Shirt - I'd be thrilled to have either! I love the Elizabeth Claire Peasant dress and the Griffins Garden Dress was a super close runner-up---either one would be awesome!! I'm having a hard time deciding! But, all in all, I like the simple Georgia dress with the little but of ruffle action in the front. I like the love me knot dress. Great shop! I love the 'Brooke dress or shirt'. Thanks for the giveaway. Love the ruffled rumba skirt! I love the clean and simple lines of the Georgia Dress! Really like the Griffin Garden Party dress or the Georgia dress. I like The Brooke Dress or Shirt - SEWING PATTERN, Long/Short Sleeve. I would love to win the Catie dress of shirt - halter neck! What lovely patterns! The Brooke dress is cute with the ruffled pants. Oh, the Double Ruffle Knot Top is sooooo precious. Thanks! Hope you are well. I love the ruffle rumba skirt! So many adorable patterns! The Double Ruffle Knot Top is my favorite. I think the two-tiered skirt is the cutest!!! I also think my 8yr old daughter would like a version! I love the Peek-A-Boo Skirt!!! The Elizabeth Claire peasant dress is my favorite! I really like the prep school pleated skirt. All those patterns are beautiful! I love the Little Lauren dress and the Apron Knot dress, so cute!! Oh boy, Georgia Dress, Double Ruffle Top, Rhumba Ruffle Skirt, Pleated Skirt, etc...All of the above. Lol Would love to win! Would love the Ellen's pinafore and the apron front skirt!! I absolutely love love love the small fry neck tie! I love the Griffin's garden party dress and the girly twirly skirt! I LOVE LOVE LOVE the Ruffle Rumba Skirt with the Ellen's Ruffled Pinafore!! I have already bought several of her dress patterns! They are awesome! I do not have the Brooke dress and would love to! I really love the Love Me Knot Dress and I like the georgia dress aswell! So many cute patterns.......I like the Apron Knot dress and fancy ruffle pants too! Any of the patterns would be AWESOME!! I love the Prep School Pleated Skirt--I wound make a pair for my girls (possibly using reverse colors?) and definitely one for a doll! They are all great. I love the Love Me Knot Dress and the Knot Apron Dress. they are both wonderful. I would love to win the apron knot daughter and doll dress. I have been spending lots of time making dolls clothes for my girls. They would be thrilled to have matching clothes for their dolls. Love, love the Elizabeth Claire Peasant dress. I finally have a little girl to start sewing for! I just bought the Double Ruffle Knot top and LOVE the pattern, it came out SO cute! I would like to try the Love Me Knot Dress next. Thanks for the fun, I added this shop to my favorites too! Griffins Garden Party, I have to have it. I would love the Georgia dress pattern. I would love to win the Sun suit and ruffle skirt!!!! The Elizabeth Claire Peasant Dress or the Georgia dress - both fab. I love everything all the ruffles! But in reality it looks like the George dress would be the easiest for me to actually make! The Brooke dress is so cute - love those gathered long sleeves! Griffin's Garden Party and the two-tiered mini skirt. I love these. My nieces would look so cute in them. Thanks for the giveaway. I really love that Brooke top... crossing my fingers! I really love the Apron Knot Dress! These are too cute! I love the Fancy Pants Diaper Cover and the Apron Knot Dress. I love the Prep School skirt. Too cute! I've purchased her Brooke Dress and Small Fry Neck Tie patterns in the past. They are super-easy to follow. The prep school skirt ..love them all though! Thank you for the give away! The Little Lauren Dress and the Georgia Dress are awesome, and I would love to try out either pattern. I loved the ruffled pinafore as well, but I couldn't find the pattern on her site for the little bloomers to match. Where can I find that one to purchase on my own?